This recipe is totally inspired by Chef Michael Smith's Homemade Breakfast Sausage in Real Food, Real Good. When I first discovered I had allergies, I was really discouraged by the fact that almost every brand of sausage has corn syrup, corn flour, or soy flour as fillers. Making your own patties from scratch definitely is the way to go. Why bother shaping them into actual sausage? Patties are easier anyway. I've tried these with pork and with turkey, and then with a combination of the two. My favourite tends to be pure pork. Make them ahead and tuck into the freezer so that on busy mornings all you have to do is thaw one in the microwave. Eat them cold, tuck them into biscuits, sandwich them between pancakes, you know what to do. Either way they are just plain awesome. 1. Pre-heat your oven to 350 F. Line a rimmed baking sheet with parchment paper and set aside. 2. Gently grate your apple using a box grater, then grab handfuls of the apple and holding it over a sink, squeeze out the juice. Do this with all the apple so you get most of the moisture out. Add it to a large bowl, along with all the other ingredients. 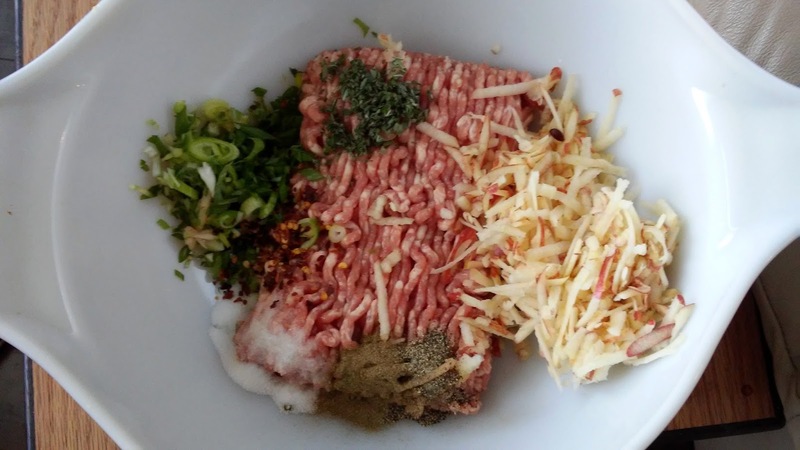 With your hands, gently mix everything together. 3. Divide the mixture into 8-10 balls and flatten them to about 1/2 inch thickness. It's easier to do this if your hands are slightly wet. Place the formed patties onto the lined baking sheet. 4. 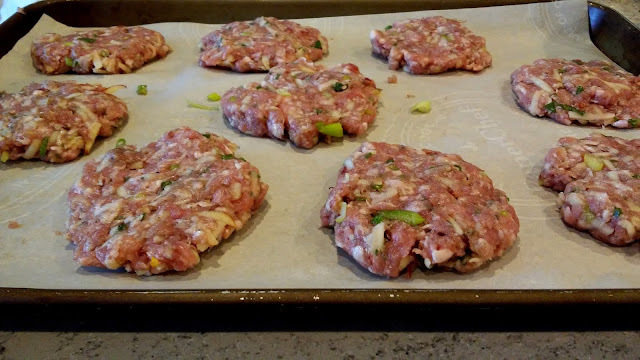 Bake the patties for approximately 15-20 minutes until cooked through. You will notice that they will release a lot of liquid and not necessarily crisp up a lot. If you want them to have a little bit of a crust and brown up, heat up a little oil in a non stick fry pan and quickly give the outsides a quick browning before setting them aside to cool. 5. Once the patties are fully cooled, you can serve them or pop them in a sealed freezer bag and put them in the freezer. Then on a busy morning just grab one out of the freezer, thaw on the defrost setting in your microwave, and you're good to go!